For those of you who haven't been to L&B Spumoni Gardens in Bensonhurst, you should. I recommend this place to everyone. The pizza is unique and the atmosphere relaxed. Here is a video on Man vs Food about the pizza: . I used this video as a reference to the workflow. The defining features of the pie are that the cheese is underneath the sauce and blends seamlessly into the dough. Its hard to tell where dough ends and cheese begins. The dough is pillowy and slightly undercooked (especially in the center pieces). There are no large air pockets; the crumb is uniform and small. The texture is very light. The sauce is basic but slightly sweet, oily, and coated with a whole lot of pecorino romano cheese. For those of you who don't know, pecorino is similar in texture to Parmesan cheese, but is made from sheep's milk and is very sharp and stinky. 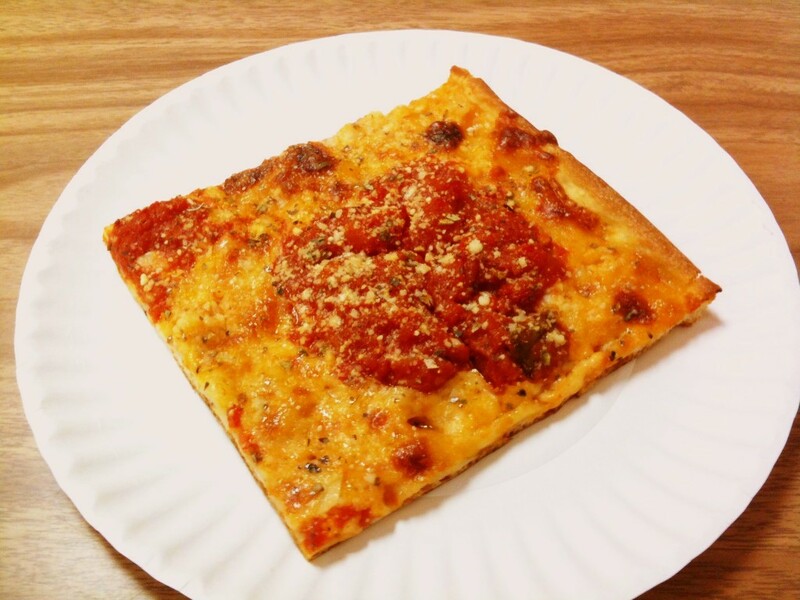 Even if you don't like sicilian, you still will love L&B. It is not heavy, not too cheesy, and always fresh (the place is always busy). I did a lot of research online and couldn't find much information about recreating this pie. I know that the owners come from Sicily. The Sfincione from Sicily looks very similar to the L&B pie. So, I decided I would start with a sfincione dough. But, I never found a recipe given in weight measurements, only volume, so I didn't do anything. Over Christmas vacation Kenji Alt (serious eats) posted his version of a no-knead sfincione: http://slice.seriouseats.com/archives/2011/12/the-pizza-lab-sfincione-the-original-sicilian-pizza.html. This looks very similar to L&B, and I figured it would be a great starting point. Mixed cool water, IDY, Salt together first (thanks to Chau for the workflow). Then I mixed in the Flour and then the oil. I covered the mixture and refrigerated overnight, for 18 hours. After removing from the fridge, I punched it down to get out all the air (there are no large air pockets in L&B's dough, and they use a sheeter which would push most of it out). Then I poured 2 tbsp EVOO on the pan and another tbsp to coat the ball of dough. I dropped it in the pan and flattened it a bit to get the rest of the air out. I waited 2 hours and then shaped and topped the dough: Mozz first, then sauce, then pecorino, and finally olive oil. I set up an 'oven in an oven' for this bake. Why? because L&B cooks in a deck oven with a very small clearance. I wrapped one of the oven racks in til foil. I put a pan and a cast iron pan on top of it to absorb some heat. I set the oven to 400 degrees and let it preheat for about 20 minutes (forgot to set a timer). At launch, the steel stone was 780F (bad reading? ), ambient 600, and the cast iron was 390. At launch, I upped the oven to 425 degrees. The total bake time was exaclty 15 minutes, with a 180 rotation 6 minutes in. Note that my pan is bigger than my stone, and was partially hanging off equally on both sides. -The texture was very close; perhaps wait longer to bake the pie; I had trouble stretching it to the full pan but I was getting hungry!! -Shorten bake time by about 1 minute to undercook the center a bit. L&B makes a whole cake pan, so the center is naturally cooked less. Using a half pan, it cooks more uniformly. -More pecorino (I barely tasted it, and I thought I used a lot). -Little to no pan oil. The crust almost tasted like Pizza Hut because there was so much oil. You can see from my photos that there was a pool of oil, and that's after I absorbed some with paper towels. It was way too fried. It doesn't look like L&B does this at all, but their sheets are well seasoned. -Switch to a neutral oil for the dough-I only had EVOO available. Because of the taste of EVOO, the dough had a bready quality to it that you don't get at Spumoni. -This was my first time with this method, but Tin Foil seemed to do just fine. Thanks to everyone who has posted this method before. -I only used one layer of regular tin foil. 2 layers of heavy duty would be even better. -My steel stone preheated very fast. -I will definitely give this method a shot for a NY pie. Baking down bottom at first and then switching to the broiler (which would probably stay on) after. If anyone else has tried to duplicate L&B or tries because of my post, please let me know! Very nice write up and great job on the pie. So what did the crumb taste like, did it have some complexity? Does the L&B original rely on the toppings for flavor, or are you after the crust itself? Thanks John. I'm after the whole pie, but I figure the crust is the most difficult. The crumb had a good taste, there was definitely some complexity from the ferment-I could smell it when handling the dough. But, the EVOO overpowered most of the crust flavor. Changing the oil is a must (as Scott123 has informed me), as is using less pan oil. I found that my toppings were similar, though I did not have enough pecorino (or maybe just not sharp enough). I also could have used a tiny bit more salt in my sauce- I eye ball this so I have no idea how much I used. The cheese at L&B is also much more stretchy, though the taste is not much different. I am informed by some members that they use Grande... I don't really want to buy a massive brick at RD, so supermarket brands will have to do. The consistency of my sauce was very close. I simply pour the can into a colander, drain out all the excess puree and juices, and then shake for about 30 seconds to get as much liquid out as possible, and then blend until uniform. Thanks for the added information. I am going to try this pizza this weekend. I have been looking at some videos from L&B - do you think that the hydration is a bit lower than nearly 70%? I was thinking in the mid 60's, but I have not used All Trumps in ages. It may be that the high gluten makes it look less elastic than it really is. And from your pics, I think you have the right TF. In my attempt I may use KABF. And I want to use CY, so I am going to up the percentage to 1.5% and stretch out the cold ferment to 24 hours. Let me know if you think I should try anything else. I think their pizza has to be a bit lower hydration. The dough I made would never get through a sheeter alive. I have never really worked with KABF, so I'm afraid I can't offer much advice. Hopefully others will step in. Good luck. Nothing else except remember my warnings about oil! Do you know for sure they are using All Trump or the like? You describe a softness to the product middle - I usually do not associate softness and lightness to AT. I don't know if they use AT. I have been told they use a high protein bromated flour, but not the brand. I think you should try with the KABF and see what happens. I've been using Con Agra Occident, which is a bromated baker's flour. It's protein is in the bread flour range (12.4), yet it makes a soft, light dough. I've had very good results with it for both pizza dough, bread and even bread machine made bread. It may be worth a try if you can get a bag of it. I used 75/25 KAAP and Giusto's Ultimate Performer to get the protein count up. Mix, autolyse, 2 stretch and folds 1/2 hour apart, and into the fridge for 24 hours. Out for 2 hours, in the pan, proofed another hour. Baked at 450 for 15 minutes with convection on. The sauce was SM tomatoes with salt, pepper and fresh oregano, cooked down for 20 minutes. Whole milk mozz, high quality percorino, EVOO. The second pie I got a little fanciful, and put roasted eggplant, basil and smoked mozz - but still put the sauce on last. I could easily eat this for the rest of my life and not want for more. The center is fluffy and moist, the bottom crisp and slightly charred, the cooked sauce reduces even more and mixes with the cheese. My family loved it. The yeast amount I used is probably too much, and I am sure they use AT or the like for flour. All in all I think it came very close to the real deal, even though my crumb was a bit holey. Wow John, that looks wonderful. I'm going to try again next weekend on this one. I'll probably go with the same dough, but as a same-day dough. This should get it closer to the real deal. Taking the sfincione recipe and using that as a starting point was pretty brilliant. L&B's square continues to be one of my all time fav pizza of any kind. The attempts here look fantastic! I am gonna take a stab at this again (came close in the past) in consideration of what you guys have done here and also what I have gleaned since my last attempt. I am also gonna take a stab at a local Brooklyn Grandma slice ( https://lh3.googleusercontent.com/-ZnCSXAIKA8g/Tuf6YhgNyWI/AAAAAAAAACE/Lc02g_gK76w/s1600/449264425.jpg ) that I am also incredibly keen on as well. It is a garlic and flavor bomb. It is a nice break from a full-height Sicilian as it isn't quite as bready. I am glad square pies seem to be coming back into the zeitgeist ! I am getting some high protein spring wheat flour to approximate AT for my next attempt. My first attempt was half hearted in that I made a dough that I would like instead of a L&B clone. I was also going to do a same day dough as well with IDY - what are you thinking in terms of percentage? This will obviously be a room temp ferment. I am thinking the hydration is lower 60's. Thoughts? I've seen that video--there's really no way to tell if he has the crust from the video. The quality isn't high enough and there's no cross section. But that definitely is an L&B clone with a lower hydration. That video has been a great reference to me in the past too. I like how the guy in the vid overlaps the cheese for a "full blanket". The cheese baking into the dough at L&B is def what makes it really special. The crumb at L&B is not very moist, which leads me to believe it is much like regular (non-upside) NYC Sicilian dough, which is typically the same as for thin crust, just a bigger dough ball (2+ pounds) that gets pan proofed. This would lead me to also believe that the oil percentage isn't terribly high in L&B's formula and that the hydration percentage is probably somewhere between 60-65%. Thanks Tyler. From the pictures I have been looking at on Google, I am convinced that this is a high protein dough that is heavily mixed. The dough structure looks like a tight mesh, which means the dough had been taken to the intensive stage during mixing. This would fall in line with either a heavily yeasted dough that is kept in a cooler overnight or a same day mix and 8 hour rest or so. Do you have confirmation that they do a same day dough there? This pizza is haunting my dreams! I am going to try it on Saturday.